This is the main dining hall of the Yanggakdo International Hotel. the neon accent lights and majestic murals of mountain scenes completed the surreal, frozen in time vibe of the place. Beside my tour group and the other marathon groups, there was nobody else eating here. Food was fair. Typical Korean dishes, but using very low quality ingredients. Meat was fatty, and the overal selection was limited, however in good quanitity. The impression I got was that they cooked up whatever they could acquire in enough quanitity. So some nights there were tons of onions and potatoes, and some nights tons of other random dishes. 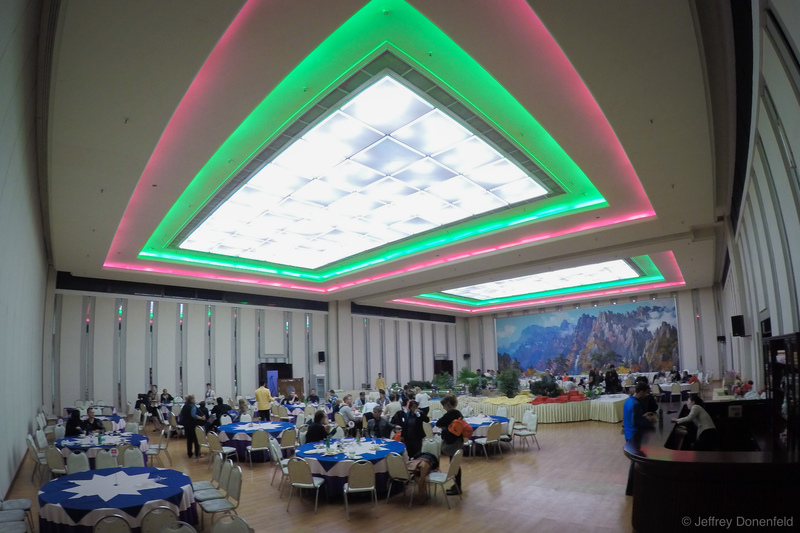 This is the main dining hall of the Yanggakdo International Hotel. the neon accent lights and majestic murals of mountain scenes completed the surreal, frozen in time vibe of the place. Beside my tour group and the other marathon groups, there was nobody else eating here. Food was fair. Typical Korean dishes, but using very low quality ingredients. Meat was fatty, and the overall selection was limited, however in good quantity. The impression I got was that they cooked up whatever they could acquire in enough quantity. So some nights there were tons of onions and potatoes, and some nights tons of other random dishes.